Creating campaigns in Excel is my go-to choice for many reasons for Google AdWords and Bing Ads. One reason is that I can take my keywords that I’ve built and replicate them with the broad match modifier to replicate any campaign. The problem is how to do this within Excel. Adding a (+) symbol could turn into a formula, so it becomes confusing. The way to create bmm keywords in excel is with the substitute formula. 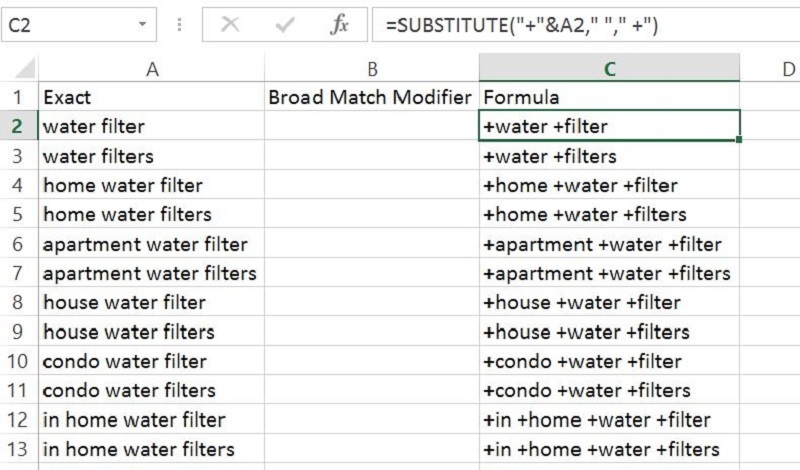 Here is the method to develop broad match modifier keywords in excel. We need to write out the keywords that we want to target. Let’s say we want to build out our exact match keywords first. For this example, I wrote ten or so keywords that I would like to target. To create this as a broad match modifier, I go to the substitute formula to put in the “+” symbols in it. The formula efficiently works like this. The substitute part allows us to add the “+” mark right in front of the cell reference which in this case is A2. The next part of the formula leaves a space after cell reference A2 to create the space for the keyword. The next part of the formula again adds a “+,” but if you notice carefully, I left a space in front of that symbol. This area is incredibly vital for BMM keywords for your campaigns in Google and Bing. Having that space after each word allows the BMM keywords to efficiently served. This formula has a focus on the “+” in front of every word. If you only want the “+” symbol in front of one or two words, you can create a long formula that can concatenate multiple cells and have the “+” in front of specific cells.